(Press Unit in the Office of the Prime Minister) – Local developer Faron Lawrence was recently recognized by Prime Minister, Dr. the Honourable Timothy Harris for making another modern and affordable housing programme available to the people of St. Kitts and Nevis. Mr. Lawrence owns and operates SKN Homes, the real estate company responsible for the Cane Grove Housing Development located at Douglas’ Estate, St. Peters. 50 homes will be constructed under this development, and according to Mr. Lawrence, these homes are intended for middle and upper middle income persons and families. Speaking during his last press conference on August 2, Prime Minister Harris said this type of entrepreneurship is welcomed by his Team Unity-led Government. The St. Kitts and Nevis Prime Minister further stressed that the Cane Grove Housing Development, once completed, will significantly complement the Team Unity Government’s own home ownership and home assistance programmes. 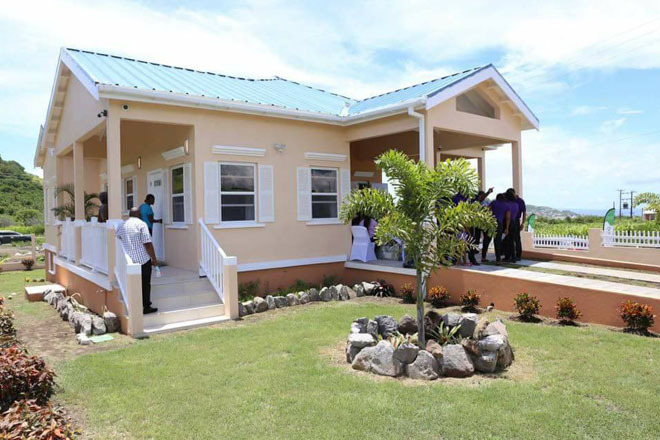 Earlier this month, Prime Minister Harris reported that the National Housing Corporation (NHC), under the Unity Housing Solutions Programme, has made progress on 127 housing units to date, with houses being constructed in every constituency. “You would recall that before we started this year with this programme [the Unity Housing Solutions Programme], which we launched around February or thereabout, we had already given out 84 houses completed. So, in just over two years, we would have delivered 211 Unity Housing Solutions,” the prime minister said, adding that construction on another 100 units will soon commence. Furthermore, Dr. Harris stated another 263 persons have benefitted under the Government’s first time homeowners programme, which was earlier this year extended to the end of December 2018. To date, one home is completed at the Cane Grove Housing Development, with construction already underway on four more houses. Financing for the homes under this programme are available through special arrangements with the St. Kitts-Nevis Anguilla National Bank, CIBC First Caribbean Bank, and the TDC Financial Services.